Police clash with demonstrators during an anti-fascist and anti-racist march to protest against a Lega far-right party general election campaign rally in Milan, Italy, Feb. 24, 2018. Italy has had 64 governments since the World War II and many more prime ministers, but even by its own chaotic standards the country is mired in one of the most divisive and increasingly violent parliamentary elections in recent years. Rising political violence has prompted comparisons to the 1970s and early 1980s — the "Years of Lead," as they were known — when the country was engulfed in political and social turmoil and buffeted by domestic terrorism launched by extremists on the right and left of the political spectrum. Twenty-one parties — and two highly unstable electoral alliances with shifting allegiances and sharp personal animosities, also darkened by intrigue worthy of the Borgia era — are competing in a race that has become shriller and more menacing with each passing day. Politicians haven’t restrained their political rhetoric, hurling accusations with abandon at their rivals, smarting their characters and alleging treachery. The political language matches the grim, tribal mood of an electorate in the grip of anti-migrant fervor and furious with a political system seemingly incapable of grappling with key bread-and-butter issues. Voters have become angrier as the election campaigning has unfolded, as well as more violent. This was demonstrated this week as police in several towns scuffled with bottle-throwing far-left protesters to block them from closing in on provocative anti-migrant and far-right rallies, where speakers call for the mass expulsion of the more than 600,000 migrants who have arrived in the country in the past two years. On Friday, political violence plunged the center of the coastal city of Pisa into chaos and sent shoppers scurrying as left-wing protesters mounted a violent demonstration against Lega leader Matteo Salvini, who was speaking at a public rally and repeating his pledge to fight Brussels to ensure that “Italians come first.” Protesters threw smoke bombs, stones and bottles at blue-helmeted riot police. Italian Lega supporters hold flares as they arrive at political rally led by leader Matteo Salvini, in Milan, Italy, Feb. 24, 2018. In Turin, six police were hurt Thursday as they battled anti-fascists trying to reach a rally mounted by CasaPound, a neo-fascist grassroots group turned political party. The skirmish was described by local officials as "very serious.” They said the protesters clearly “intended to hurt” the police. "Italians can no longer walk around this area peacefully, because of all the foreigners that continue to arrive end up here," Carlomanno Adinolfi, a group member told reporters. On Saturday police imposed a major security clampdown on Rome as political tensions mounted in the final days of the March 4 elections. A Mai piu fascismo (fascism never again) march drew thousands, and beforehand police warned demonstrators from carrying “blunt objects and rigid flag poles” and from wearing helmets and hard hats. The tone for violence was set earlier this month when a onetime regional candidate for the right-wing populist Lega party, a key group in a right-wing alliance with former prime minister Silvio Berlusconi’s Forza Italia, shot and wounded half-a-dozen migrants in a central Italian town 200 kilometers from Rome. Street skirmishes between neo-fascists and leftists — as well as racially motivated attacks on migrants — have increased ever since. In the central town of Perugia, a campaigner was reportedly stabbed and wounded midweek while putting up campaign posters for Potere al Popolo (Power to the People), a coalition of communist parties. And politicians have been singled out for attack. Candidates receive death threats on social media. Laura Boldrini, the speaker of the Italian Parliament, who has been a vehement opponent of racism, has received more than most — she also received a bullet in the mail. She is competing for reelection in Milan but is living in a secure house, the whereabouts of which are a closely-guard secret. Effigies of her and the country’s current left-wing prime minister, Paolo Gentiloni, were burned last month by youth members of the Lega in the northern town of Varese. 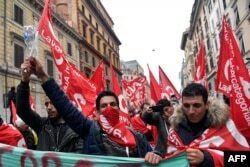 People take part in an anti-fascist march called by Italian left-wing parties and union organizations, in central Rome, Italy, Feb. 24, 2018. On Wednesday, a regional leader of Forza Nuova, a stand-alone far-right party that blames migrants themselves for anti-migrant attacks, was abducted in Palermo, Sicily, by leftwing activists wearing balaclavas, who bound and beat him. The activists sent a video of the assault to news stations, accusing their victim, Massimo Ursino, of spreading hate and racism across Italy. “We tied him up and beat him to show that Palermo is anti-fascist and there is no place for men like him here,’’ they said. Palermo’s mayor, Leoluca Orlando, said the attack was a sign of the “shameful and disgraceful” state of Italian politics. “We can’t beat fascism with violence. We can’t beat fascism with fascist behavior,” he added. The rise of the far-right has prompted the rise of a new far-left, which appears determined to be muscular. The day before the Palermo attack, the Italian intelligence services released their annual security report detailing potential hazards to the country. They identified radical Islamic terrorism as the greatest of the security challenges facing Italy, but the agencies also noted that home-grown extremism and the increased presence in Italy of far-right groups, and “fierce Neo-Nazi networks” promulgating racism and intolerance, posed a grave risk, too. The Italian security services also raised the possibility of cyber-campaigns aimed at influencing public opinion and the country’s political orientation in the run-up to the March 4 election, worrying such campaigns would seek to introduce “destabilizing elements” by exacerbating online Italy’s political, economic and social divisions. Although Russia wasn’t mentioned by name, U.S. and Italian analysts have warned that European elections have been targets for Russian meddling. But La Stampa newspaper in an investigation has found scant evidence of Russian actors using social media and cyber-attacks to try to shape this election cycle in Italy. The country’s domestic political actors have proven all too capable of poisoning the political atmosphere without a helping hand from overseas, analysts note.